Launching today its first annual report (2017-2018) under the name of amfori, the leading global business association for open and sustainable trade showcases a year of landmark achievements, rooted in its new Vision 2030 Strategy for inspiring action around the world. This sends an encouraging message to all who want to use trade for good in the world. In times of anti-trade rhetoric and protectionism, amfori reports the strongest ever increase in its membership and geographical outreach: with 270 new members since this time last year, the association now boasts a membership consisting of more than 2,200 retailers, importers, brands and associations across 44 countries on 4 continents, representing a combined turnover of €1.6 trillion. amfori’s top five growth countries were USA, Canada, Australia, UK and Spain, with the notable example of the USA, where membership grew 1,650%. This shows that companies are more committed than ever to trading sustainably. It also demonstrates their trust in amfori as the association to support them in preparing for the challenges of the future. “Building our future” is the theme of amfori’s Annual Report 2017-2018. 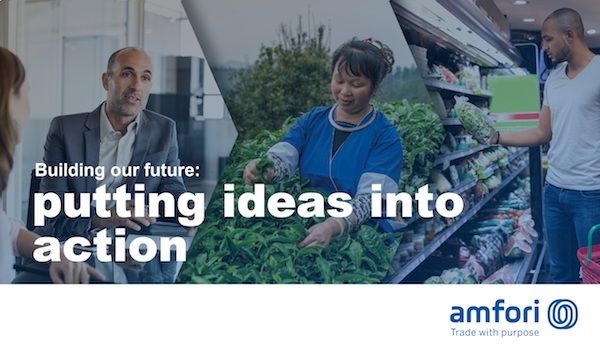 It covers a year in which the association celebrated its 40th anniversary, unveiled a new name and branding, inspired by ancient trade, and deployed its bold Vision 2030 strategy for setting the pace and scale of trade with purpose through leadership, collaboration and excellence. Delivering on the strategy, amfori introduced a new governance structure, extended its membership offering and expanded upon its global network to bring its members closer to the operations of their business partners in supply chains that stretch across the world. amfori BSCI – the association’s social compliance service - was strengthened with the launch of its own Audit Integrity Programme, raising the bar for audit quality, the development of the Country Due Diligence Tool for mapping and managing risks in specific countries and the addition of a Responsible Recruitment Module for empowering business partners across the world to implement good practices. amfori BEPI - the service for improving environmental performance in global supply chains - provided support to producers for getting started by developing multilingual how-to-guides in 11 environmental areas and boosting training activities, recording yet another year of a double digit growth. amfori Advocacy confirmed its reputation as the voice of global, open and sustainable trade, both at international and local level. amfori Advocacy contributed to, amongst other things, the re-instatement of the GSP+ status of Sri Lanka, organised a European stakeholder forum on trade with the participation of the European Commissioner Cecilia Malmström and presented the business case for gender equality at the UN headquarters in Geneva. New and strengthened partnerships at international and local level enriched amfori services in the reporting period, the key among them with Swiss non-profit, myclimate, for mitigating carbon emissions in the supply chain, the Zero Discharge of Hazardous Chemicals Programme (ZDHC), the German Partnership for Sustainable Textiles, the Chinese Belt and Road Industrial and Commercial Alliance (BRICA) and the EU Chamber of Commerce in China. In co-operation with the Thai Ministry of Commerce amfori launched a 12 month capacity building project for responsible recruitment practices supporting due diligence by small companies in global supply chains. To match its ambition for inspiring action across the world and serve its growing global membership, in 2017-2018 amfori established its first office in Latin America, based in Argentina, opened one in Bangladesh and added to local teams in India and Greater China. A dedicated local networks report 2017-2018 presents the activities managed by amfori local representatives. To access the full amfori annual report, click here. amfori is the leading global business association for open and sustainable trade. We enable retailers, importers, brands and associations to enhance human prosperity, use natural resources responsibly and drive open trade globally. We call this Trade with Purpose.